Pakistani Prime Minister’s Foreign Affairs Advisor Sartaj Aziz and National Security Advisor Ajit Doval had a brief interaction in Amrtisar on Saturday night, amid intense strain in Indo-Pak ties in the wake of Nagrota terror strike and intensified cross-border firing in Jammu and Kashmir. Aziz and Doval had a short informal chat after foreign ministers of five countries called on Prime Minister Narendra Modi on Saturday night in a group. The call on by the foreign ministers preceded an official dinner attended by representatives of almost all countries participating in the Heart of Asia conference in Amritsar. 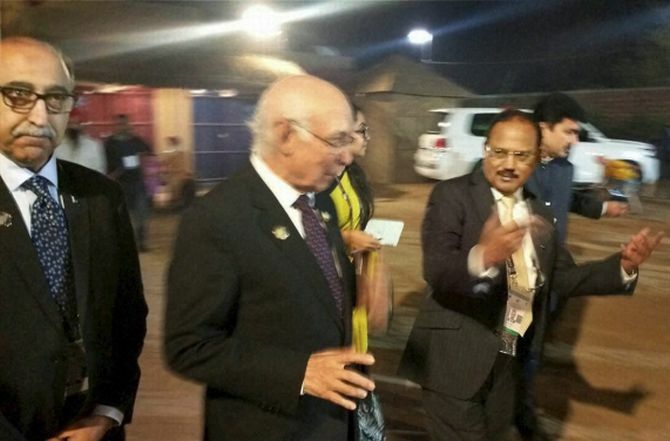 While Indian sources said Aziz and Doval 'had a stroll for about 100 feet' at the venue of the dinner 'Sada Pind', a heritage village, Pakistani officials maintained that they had a 'meeting'. However, it is not known what transpired during their conversation. When asked, External Affairs Ministry spokesperson Vikas Swarup only said, "There was no meeting. This is to categorically state that there was no pull-aside or a bilateral meeting between the two (Aziz and Doval)." India had already made it clear that it will never accept continuing cross border terrorism as the ‘new normal’ in bilateral ties with Pakistan while asserting that talks cannot take place in an atmosphere of ‘continued terror’. Tensions between the two countries escalated after the cross border terror attack on an army base in Nagrota in Jammu.